Mobile operator Sprint has repeatedly indicated it’s not to happy to have to compete with Clearwire in the retail arena…and since Clearwire doesn’t sell handsets, hotspots and WiMax access for notebooks are the main points of contention. 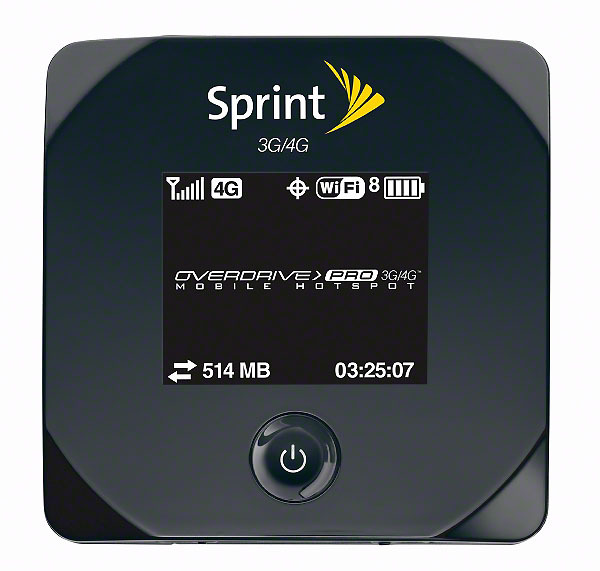 Potentially throwing more fuel on the fire, Sprint today announced its new Overdrive Pro 3G/4G Mobile Hotspot, the second generation of its Overdrive mobile hotspot. The Overdrive Pro connects to Sprint’s 4G WiMax network—dropping back to 3G in areas where WiMax isn’t available—and supports up to eight Wi-Fi devices instead of the five its predecessor handled. The Overdrive Pro also features a larger LCD display to it’s easier to see the device’s status. The Overdrive Pro 3G/4G/ Mobile Hotspot is made by Sierra Wireless. Sprint says the Overdrive Pro starts up and shuts down 35 percent faster than its predecessor and, despite the larger display, is actually smaller than Sprint’s previous offering. The Overdrive Pro supports 802.11n Wi-Fi networking and Wi-Fi devices should be able to connect to the hotspot within about 150 feet. The Overdrive Pro features an integrated security system that’s enabled right out of the box so users don’t have to be worried about unknown people surfing on their connection, even in a public place. The Overdrive Pro also features external antenna ports that can be used with a separate docking station, which Sprint plans to offer for sale soon. The Overdrive Pro 3G/4G Mobile Hotspot is available now for $49.99 after a $50 mail-in rebate and a new two-year service agreement. Service plans start at $49.99 a month for customers that already have an eligible voice plan, meaning over a two year contract customers are paying at least $1,250 for use of the device and service—not counting taxes and fees.